The Instant Pot craze is real! 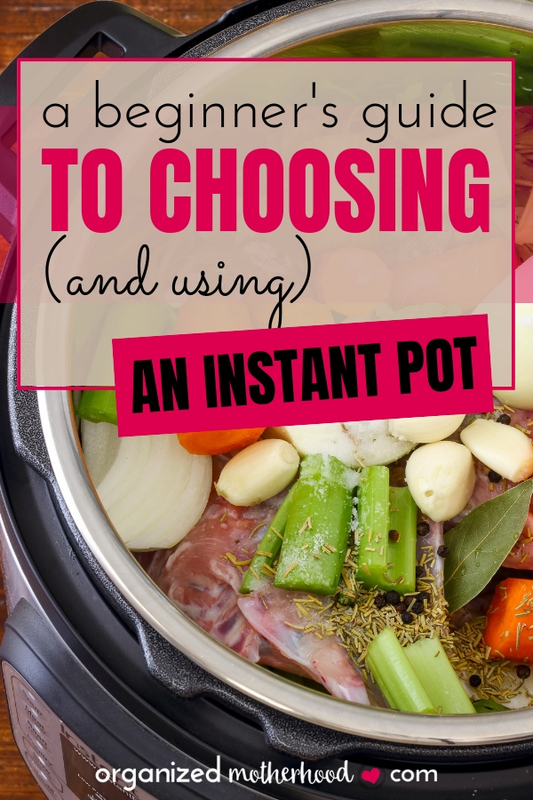 But how do you choose an Instant Pot (and do you really even need one)? If you’re on the fence about getting an Instant Pot, or if you recently got one but have no idea what to do with it (no judgment – I left mine in the box for over six months), read on! Learn which Instant Pot will work best for your lifestyle, what you can make in your Instant Pot, and where to find great recipes. Chances are that you’ve seen Instant Pots on the shelves of your local superstore, on Amazon, or maybe you’ve come across one of the many blog posts, social media posts, or forum posts singing the praises of this fresh take on the old-fashioned pressure cooker. But the Instant Pot is the perfect solution for people who like the idea of cooking a tender roast in a fraction of the time that it takes in the oven or slow cooker. While our mothers and grandmothers were comfortable using a stovetop pressure cooker, most women of this generation have been intimidated by the hissing and the potential of having it blow up. Because of this, pressure cooking has fallen out of favor in the last few decades. All that has changed with the arrival of the Instant Pot – a self-contained, electric pressure cooker with plenty of built in safety features. With the promise of being able to cook a meal in 3 to 10 minutes of pressure cooking, it’s no surprise that this new electric appliance is quickly gaining a large fan base. Instant Pots are flying off the shelves, and you can find plenty of fans online who share their favorite recipes, tips, and adaptations on blogs and popular Instant Pot Facebook groups. The Instant Pot is a self-contained unit that sits on your countertop and plugs into an outlet. It takes up about as much space as a rice cooker or a small slow cooker. It’s controlled through a digital interface. You tell it how long you want to cook your meal under pressure, set the timer, and you’re good to go. It automatically brings up and holds the pressure at a safe level and will not allow you to open the pot while it’s pressurized. This makes it as easy to operate as a microwave. It’s not surprising that this new take on an old kitchen tool is quickly gaining popularity. The cooking is very hands-off. Simply set it, and then walk away until you’re food is ready. The Instant Pot has all the advantages of using the slow cooker, but takes a fraction of the time – perfect when you want to get a home cooked meal on the table quickly! One of the big appeals of the Instant Pot is how quickly it claims to cook food. Cooking an entire Sunday dinner in 15 minutes or less sounds very appealing, especially when you have hungry people waiting, but that can also sound a little too good to be true. The Instant Pot is best for dishes like stews or roasts that would otherwise take a long time on the stove or in the oven, and even longer in the slow cooker. It’s also perfect for those meals that you forgot to thaw or are taking too long to finish cooking (I’ve actually dumped the contents of my slow cooker into the Instant Pot, cooked it for 10 minutes, and presto – dinner was done!). The claims that the Instant Pot can cook chicken breast in 5 minutes, or a roast in 20 minutes, are a little misleading. While that is the time the food needs to cook under pressure, the actual time before you can eat is longer because it has to come up to pressure first. This process can take anywhere from ten minutes to half an hour. The fuller the pot, the colder (or even frozen) the ingredients, and the bigger the cut of meat, the longer it will take to come up to pressure. Once it does, the countdown timer will start. After the food has cooked for the allotted time, it also takes some time before you can safely open the pot and serve your meal. There are two options to release the pressure inside the Instant Pot, and which one you choose depends on the meal you’re preparing. The first option, known as the Quick Release method, is to release the pressure through the vent in the lid. This causes hot steam to escape and the pressure to go down within a matter of minutes. Once that’s done, you’ll be able to open the lid and serve the food. Be careful when using the Quick Release method, because the steam will be hot. Also, if you’re cooking a meal with gravy, the steam may contain some food particles. Move the Instant Pot away from the wall or cupboards before using the Quick Release (I like to move it directly below my fan). The second option is a process called Natural Pressure Release (NPR). Whenever a recipe calls for this, you shouldn’t turn the valve to release the pressure. Instead, let the pot set until the pressure releases on its own. The NPR process takes about 25 to 45 minutes and allows the food to continue cooking until the pressure valve drops down and you are able to open the pot. Especially if your recipe calls for NPR, it’s important to allow for this additional time when preparing a meal. While you won’t be able to cook your meals in a matter of minutes, the Instant Pot is still much faster at cooking roasts, beans, etc. than any other cooking style. As an added bonus, once you add everything to the pot, it’s hands-free cooking. You don’t have to stir pots or babysit the food. Instead, you can work on something else or relax while dinner cooks itself. There are quite a few different models of Instant Pot available, in different sizes, and with different functionality. The size of meals you want to cook, or even the size of your family, will determine which Instant Pot is best for you. The five-quart size works well if you usually cook for one to three people. It works great for dorm rooms, and it’s a must-have in a small apartment. But unless that description fits you, I highly recommend going with the standard six-quart size. The eight-quart size is available in a few models and is a good fit for larger families or if you know you’ll be cooking a lot of large meals for family gatherings, church dinners, etc. The Instant Pot Lux is the basic Instant Pot model and the one I recommend for most people new to pressure cooking. This is the 6-in-1 model. It’s a pressure cooker, slow cooker, steamer, and rice cooker, with sauté and keep warm functions, as well, for a total of six different ways of cooking. The Instant Pot Duo is is also called the 7-in-1. This will do everything the Lux can, but it’s also a yogurt maker. If making your own yogurt at home is on your to-do list, spring for the Duo; otherwise, go with the basic Lux model and save a few dollars. The Instant Pot Smart + app is latest main model in the Instant Pot lineup. It will do everything the previous two models do and more. The digital interface on the pot itself and the app that connects to your Instant Pot allow you to control temperature and cooking durations for your meals as you see fit. If you like gadgets, prefer the ease of being able to save your favorite recipes and instant pot settings on your smart phone, and love full control over your pot, this is the model to get. If your budget allows, go for the latest model with full smartphone app integration. 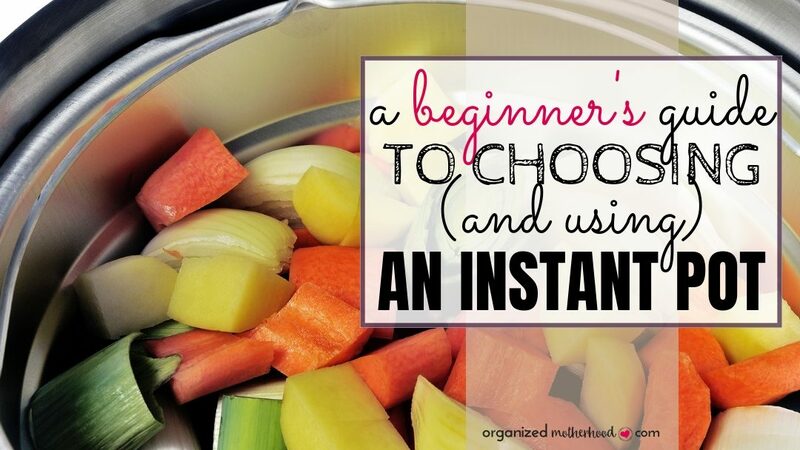 Regardless, it’s hard to go wrong no matter which model of Instant Pot you choose! Depending on the time of year, and what kind of deal you can find, the average Instant Pot will cost $70 to $150. While this doesn’t make it the cheapest kitchen appliance on the market, it’s also nowhere near the highest. On the other hand, you can pick up a stovetop pressure cooker or basic slow cooker for around $25. Does that mean the Instant Pot is overpriced, or something you shouldn’t consider buying? While the Instant Pot may not be the right choice for everyone, it can quickly become one of your most valued and most often used appliances. For example, the inexpensive stove top pressure cooker will do you no good if you’re too intimidated to use it, or if you keep it in the back of the cabinet because you don’t have the time or patience to keep an eye on the pressure and adjust the stovetop as needed. If you have young children underfoot, you may not be comfortable using a traditional pressure cooker, so the Instant Pot provides a great alternative. If you’re good at planning ahead and starting dinner first thing in the morning to slow cook a roast, you may not need an Instant Pot. If on the other hand, you’re like me and forget to get it started or thaw your meat, the Instant Pot is the perfect solution to get dinner on the table quickly. The expense of buying the Instant Pot will easily be worth it if it keeps you from going out to eat or picking up food on your way home. If you know you can get dinner cooked in 45 minutes without having to stir pots, it becomes a lot easier to go home and start that pot of chili, or the pot roast, and relax while it cooks. If it keeps you from ordering out even just once a week, it won’t be long for the Instant Pot to pay for itself. If you aren’t sure if you’ll actually use it, the Instant Pot may be a waste of money. However, if you think you’ll use it quite a bit, then keep it on your counter and use it as your pressure cooker, slow cooker, and rice cooker, it will be an investment that’s well worth it. Look through some recipes, borrow a friend’s Instant Pot if possible, and see if this seems like the type of appliance that will work well for you and your lifestyle. What’s the difference between an Instant Pot and a Slow Cooker? When you start to look into the benefits of using an Instant Pot, you may notice that there’s quite a bit of overlap with the benefits of using a slow cooker. Both appliances are good at cooking large, inexpensive cuts of meat like pork and beef roasts. Both are great at cooking beans, soups, stews, chili, etc. Both are also great for busy home cooks, since they allow you to put everything in, turn it on, and let the food cook itself – no stirring pots or watching the stove required. In addition, both are electric appliances that sit on your counter and plug into an available outlet. You can move them around as needed, they use up approximately the same amount of space, and you can take them with you to family get-togethers, vacations, etc. They even both excel at keeping food hot until you’re ready to eat. The biggest difference between the Instant Pot and the slow cooker is cooking time. The slow cooker is designed to cook your meal for a long time on a low setting. The average slow cooker dish takes six to ten hours to cook. Meanwhile, the Instant Pot will cook most meals in under an hour from start to finish. Another big difference is that while a slow cooker is just a device that cooks your meals low and slow, the Instant Pot can replace your rice cooker as well as your slow cooker since it has a slow cooker setting. Depending on the model you choose, you can even replace your yogurt maker with it. If you want more versatility in one appliance and the ability to cook a wholesome home cooked meal in a very short time, the Instant Pot is the way to go. Give it a try and see if it becomes one of the most used kitchen appliances in your house! If you’re comfortable with your slow cooker and good about planning ahead long enough to start your dinner in it, you may find that you have no need for an Instant Pot. Similarly, if you think the hissing and steaming or the idea of having a pressure cooking device in your kitchen scares you, then you’re probably better off sticking to your slow cooker. That said, with the safety features built in and the easy-to-use digital display, using an Instant Pot is just as simple and easy as your favorite slow cooker. If you’re feeling a little intimidated, I encourage you to get one and give it a try. After preparing your first two or three meals in it, you’ll wonder why you were worried! One of my favorite things about the Instant Pot is how versatile it is. You can cook a wide variety of dishes in this popular new electric appliance. There are all kinds of great dishes you can make in the Instant Pot. With the sauté function, you can even use it to scramble eggs or cook sausage in a pinch. Where the Instant Pot really shines is with oatmeal. Some of the best tasting steel cut oats come from cooking them in this popular electric appliance. No constant stirring is required for creamy and nutritious oats. You can even hard boil a large quantity of eggs in your Instant Pot. This is perfect for make-ahead breakfasts and snacks that last all week long. Since the Instant Pot does such a great job at fixing soups and stews, it’s perfect for lunchtime cooking as well. With a quick Google search, you’ll be able to find plenty of yummy recipes to try as well as lots of directions for adapting your own favorite recipes. 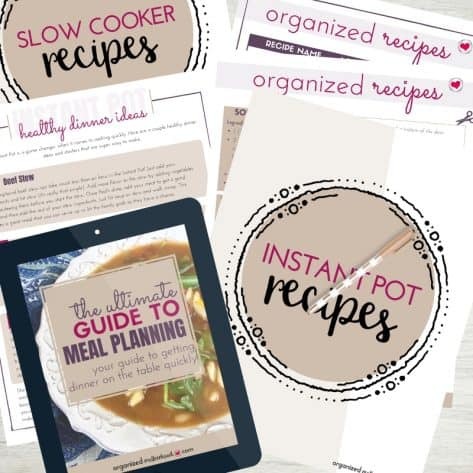 There’s also a list of 20 Instant Pot recipes in the Organized Motherhood Kitchen Binder. It’s also a great way to cook one pot meals, including pasta and rice dishes, that are perfect for lunch. Mac and cheese is also really easy – and delicious – in the Instant Pot. If you’re in the mood for a nice salad, try boiling eggs for it in the Instant Pot, or even making an entire batch of potato salad in it from start to finish. The Instant Pot is great for easy weeknight dinners that can be cooked from start to finish, like a nice big batch of beef stew or your favorite chicken dish. Pressure cookers have always been the best way to prepare large roasts or tough cuts of meat. Cook your pot roast or a big batch of homemade pulled pork in the slow cooker for a nice Sunday dinner. From various rice dishes to mashed or scalloped potatoes, the Instant Pot can take care of your main side dish for you while you’re busy cooking anything else, too! While these may not be the things you will be making on a weekly or even monthly basis, you can also use your Instant Pot for other fun recipes. The Instant Pot makes some of the yummiest and easiest cheesecakes. Yes, that’s right. You can sort of bake in your instant pot. You’ll need a springform that fits inside your Instant Pot, a rack for the baking pan to sit in, and a delicious cheesecake recipe. A quick search will bring up an almost endless supply of yummy recipes to try. Pick one and start stirring your pot. Before long you’ll be making one of your favorite indulged desserts in the Instant Pot. This is perfect for when you want to impress your guests or bring something unusual to the office potluck. Traditional pressure cookers are great for canning all sorts of fruits and vegetables. While the Instant Pot wasn’t designed with canning and food preservation in mind, you can do a small batch in it. This is perfect if you want to turn some of those ripe fruits from the local farmers market into some artisan jam. Use the Instant Pot to preserve and pressure seal your jars. Since you’re processing in small batches, you can try out various different and fun recipes and end up with some delicious jams and preserves to enjoy throughout the year. Do you use vanilla extract in your cooking and baking? There’s nothing quite like real vanilla extract, but it’s outrageously pricey. Why not make your own homemade vanilla extract in your Instant Pot? You can make your own homemade extract using real vanilla beans and vodka or other spirits. Not only is it some of the best tasting extract you’ll ever use, but it also makes a wonderful gift. We’re all busy and spending less and less time at home. As a result, it’s hard to find time to make a nice home cooked meal. So, we often rely on convenience food and takeout. While those options save time, we end up paying a lot more for our food, and it isn’t always the healthiest option. What if there was a way to save both time and money, while still getting wholesome, homecooked meals on those nights when you don’t have a lot of time or energy left? Not only does the Instant Pot cook your food faster than just about any other method of cooking, but it’s also hands-free. You can even cook frozen meat and veggies for those days when you forget to thaw ahead of time. This means that you can come home, throw some ingredients in the Instant Pot, turn it on, and then focus your attention on something else. Help your kids with homework, start a load of laundry, catch up on work email, or just sit back and relax for half an hour before dinner is served. In other words, the Instant Pot saves you time in two different ways. It will take less time overall to cook the food, and most of the cooking time doesn’t require you to be there, stirring pots and playing an active role in the cooking process. That’s a big deal and something you’ll come to appreciate when you start to use your Instant Pot regularly. An Instant Pot is a bit of an investment, even when you can find a great “Black Friday” or “Prime Day” deal on it. On average, you can expect to spend about $100 for this electric pressure cooker. The good news is that it won’t take you long to recoup this investment. An Instant Pot allows you to cook more at home instead of going out to eat or ordering takeout. This alone will save you anywhere from $5 to $50 per family meal. But it doesn’t stop there. The Instant Pot is great to cook inexpensive cuts of meat like roasts, whole chickens, and even more frugal fare like beans and rice. If you get in the habit of making just one frugal meal per week using your pressure cooker, those savings will quickly add up. You can go even further by cooking double batches and taking leftovers for lunch instead of buying it. You can also batch cook and then freeze entire meals or meal starters. Saving time and money with an Instant Pot is quick, easy, and almost automatic. The only trick is that you have to actually get in the habit of using it regularly. Pressure cookers have been around for a long time, but there are also horrible stories about them exploding in the kitchen due to user error. While they are a great cooking tool, you may be intimidated by the regular stove top models. I love the idea of being able to cook food quickly and in a healthy way by cooking it under pressure, but I have never been comfortable being in the same room with a stovetop pressure cooker, not to mention actually using it. The hissing, steaming, and rattling alone is enough to send the bravest of home cooks to the hills. Thankfully the Instant Pot is much safer and more convenient than the standard stovetop models. It has a total of ten built in safety features that will keep you safe. Combined, they ensure that it is almost impossible to go wrong due to user error or equipment failure. Let’s take the locking mechanism as an example. With a regular stove-top pressure cooker, it’s easy to try to lift the lid while the container is still under pressure and burn yourself with the hot steam that will escape violently. The Instant Pot lid will not open until the pressure is back to normal. Automatic pressure control and pressure regulators keep the pressure in the pot under control. This means you can’t generate the kind of pressure inside your pot that could cause it to explode all over your kitchen. If you ask me, that’s a very good thing. It even has sensors built in that keep the temperature in check and keep you from burning your food in cases where there isn’t enough liquid in the pot to build up the appropriate cooking pressure. Instead of continuing to heat on high and burning the food inside the pressure cooker, it simply switches to the keep warm function, allowing you to add liquid and start over. You can check the Instant Pot website for full details on all ten safety features of the Instant Pot and how they make pressure cooking safe. As long as you make sure the device isn’t damaged and keep the sealing ring, lid, and vent clean, cooking in this new appliance is as safe as anything else you do in the kitchen. Yes, there’s still a bit of hissing steam before your cooker hits full pressure and the safety valve closes, but that just makes it fun and exciting. After the first few times of using your Instant Pot, you won’t even think twice about it. Give it a try. I think you’ll love this fast new way to cook healthy, homemade meals. Now that you’re comfortable using this new electric appliance, branch out and start to look for some other fun recipes to try! Here are some of the best places, both online and offline, to find Instant Pot recipes. Since the Instant Pot has been so popular for the past few months, there are plenty of traditional cookbooks (along with eBook versions) being published. Browse through your local bookstore, or head on over to Amazon.com to see what’s available right now. If you have friends or family members who are Instant Pot fans, ask them for their favorite recipes and jot them down on recipe cards. If there’s a group of you, you can start to regularly exchange recipes. If someone brings an Instant Pot dish to a potluck or gathering, ask them for the recipe. Sign up for an Instant Pot-specific meal plan from MyFreezEasy. With step-by-step directions and an easy app that you can access on your phone, I credit MyFreezEasy for teaching me how to use my Instant Pot for delicious meals. It won’t take you long to establish a nice little library of tried and true recipes. If you’re looking for something specific, doing a quick Google search is always a great idea. You’ll be able to find chicken thigh specific recipes, or Instant Pot recipes for spaghetti and meatballs. Along the way, you’ll likely come across all sorts of different blogs where fellow Instant Pot users share their experiences and recipes. Bookmark them, or simply browse around when you come across them for plenty of fresh recipe ideas. Try the recipes as is or use them as inspiration to come up with your own take on a dish. Last but not least, let’s not forget about social media. Pinterest is a great source of Instant Pot recipes. Do a quick search and follow a few Instant Pot or Pressure Cooker boards for plenty of new recipe ideas in your Pinterest Feed. By far my favorite way to come across new recipes to try or get suggestions for recipe adaptations is Facebook groups. There are several good Instant Pot specific groups you can join and participate in. You’ll find a wealth of information in these groups along with all sorts of helpful tips and ideas. With these suggestions, I’m sure you’ll find more Instant Pot recipes than you’d ever get a chance to try. Cook up the ones that look good or sound delicious and start to build up your very own library of family favorite Instant Pot recipes. Don’t let your Instant Pot stay in the box. Get it out, try some easy recipes, and simplify your menu.